Watercolors of Brian Minor and Rebecca Minor. Exploring the experience of living near Lake Superior. 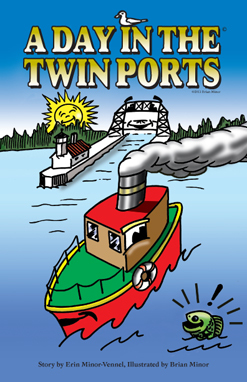 A Day in the Twin Ports coloring adventure book Join Little Lydia as she goes about her busy day in the Twin Ports of Duluth, Minnesota and Superior, Wisconsin! Lydia visits the major landmarks in the harbor, the famous aerial lift bridge, the lighthouses, steamships, iron ore docks, the port terminal and many, many more! 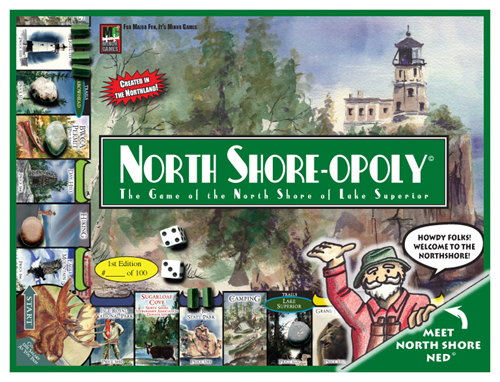 North Shore-opoly When you have a yearning to visit the North Shore of Lake Superior but don't have the time to get in your car and head up north of Duluth, North Shore-opoly is the next best thing! The property trading game that features the watercolor art of Brian and Rebecca Minor. This unique game will sure to be enjoyed by one and all in your family!